1770 LARC Tour – a family review. 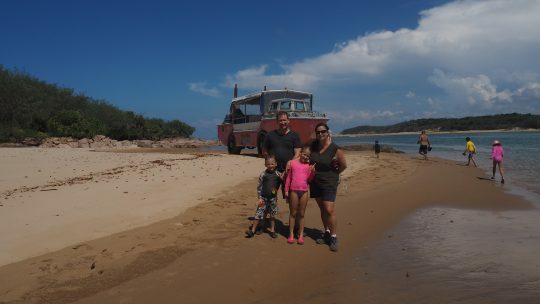 Agnes Water & The Town Of 1770 has been on our Family’s Travel ‘Bucket List’ for a long time, actually my husband and I had been wanting to visit before we started our family. 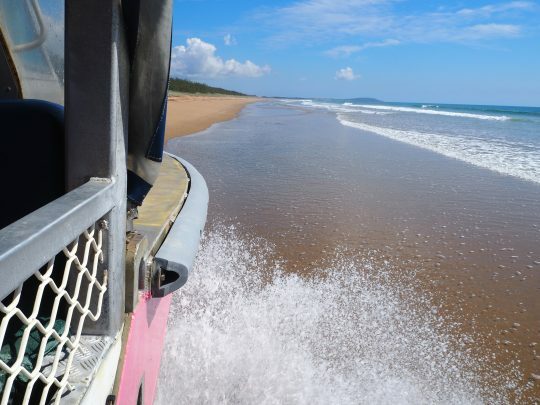 So we were thrilled to arrange a hosted 4 night stay through Visit Agnes Water & the Town of 1770! 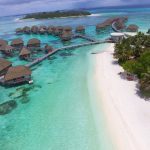 Today I’m sharing Part 1 of our adventures because we had far too many awesome experiences to fit into just one blog post! The Paradise day tour on the 1770 LARC! 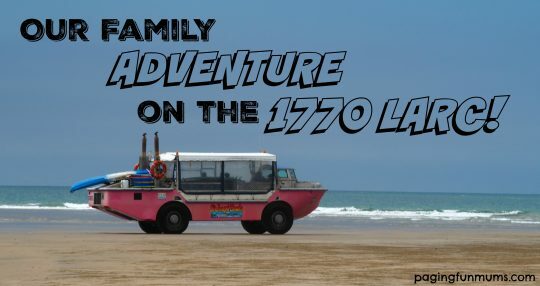 If you’re visiting 1770 with your family I strongly suggest booking a full day paradise tour on the 1770LARC. If you ask my 4 year old this was the best thing we did, he can’t stop talking about it! You can’t help but spot the two giant PINK LARCs parked on the road as you enter 1770, they look HUGE and aren’t something you would expect nor ever imagine seeing, these visually impressive vehicles will continue to amaze you with their off-road capabilities. I will never forget the level of excitement and giant smiles when we boarded the LARC and the moment we drove straight into the water. 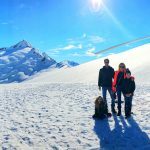 Moments like these are the reasons we enjoy travelling with our kids! The LARCs (Lighter Amphibious Resupply Cargo – vessel) have an amazing history and I can’t think of a better way to explore the surrounding areas of 1770 than in one of these unique and original US army vessels that were built back in 1965 & 1966. We were amazed by the distance we covered on our full day adventure. 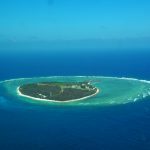 It wasn’t until the following day when we were heading to Lady Musgrave Island that we looked across the water and tracked how far we had travelled – all the way from 1770 Marina to Bustard Lighthouse. We had two ‘crew’ along for the ride with ourselves and approx 16 other guests (these vehicles are surprisingly large and we were all seated with plenty of room). Blake was our driver/captain and Ethan was on hand to share all his knowledge on both the history and wildlife of 1770 was impressive. 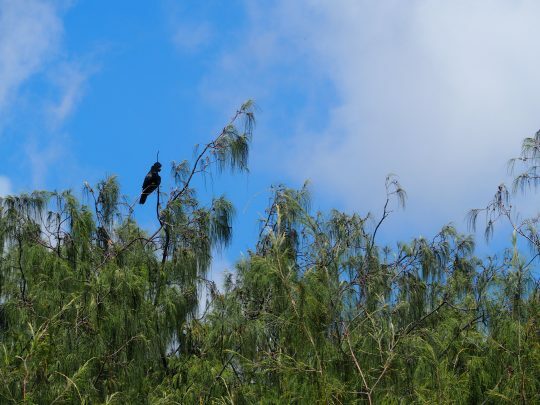 We would breifly stop to admire any wildlife we encountered, giving us plenty of time to snap a few photos (if you love bird watching, you will LOVE this trip!). Ethan also shared some amazing local stories/myths from the past which were really interesting to hear and wonder about what life would have been like living here in the past. They were both fantastic guides who ensured everyone was having an enjoyable time, they were especially great with the kids too! After travelling up the coastline, across several creeks and river mouths we arrived at the base of Bustard Head. 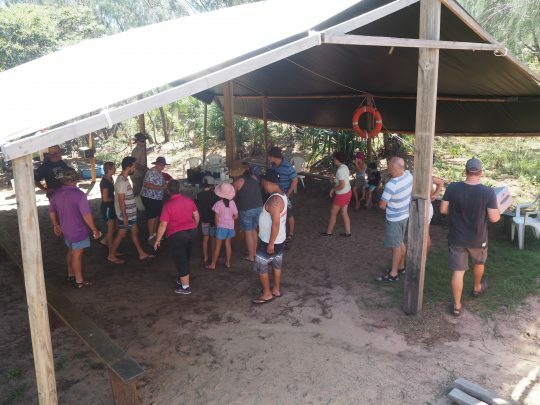 We stopped at their private camp to enjoy some morning tea and light refreshments before making the climb to the famous Bustard Head Lighthouse. It was here that we witnessed even more of the LARC’s amazing capabilities, it climbed over large rocks and easily made the ascent up steep terrain. The first views as we cleared the camp were amazing and just continued to get more impressive as the LARC climbed to the peak of Bustard Head. Words just can’t do this experience justice, this is a MUST see in person experience. 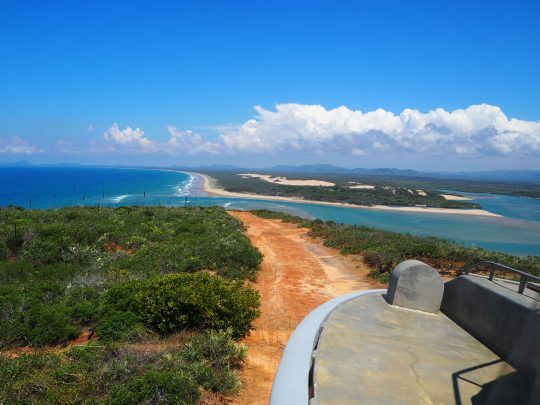 It’s also the ONLY place where you can tour INSIDE a fully functional lighthouse in Queensland. 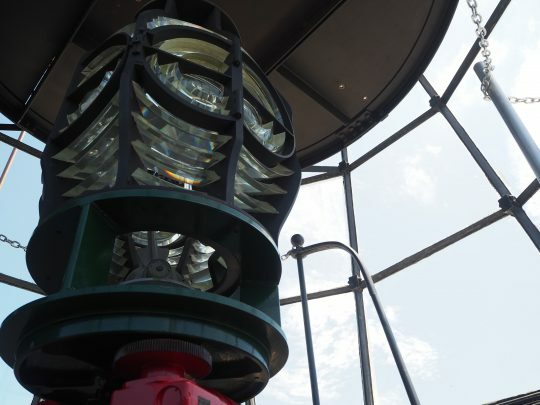 The first sight of this lovingly restored (and still operational) 16 meter high lighthouse is something to behold. I never really put much thought into lighthouses but I think I’ve caught the lighthouse bug! Seriously, there are people who travel the world in search of lighthouses and learning the history behind them…I now understand why they do. We were taken on a tour with the lighthouse keeper (Dudley ). After being Queensland’s last manual light house keeper he was the perfect person to impart and share this lighthouse’s history as we walked through the keeper’s house and viewed all the historical items in this one of a kind Museum. We were then taken on a guided tour to the top of the fully functional lighthouse which was first built in 1868, what an amazing experience to walk up the stairs and see the working parts in action, the only place you can go INSIDE an operational lighthouse in Queensland! We gained more information about the workings of the lighthouse, I was surprised to hear that it’s now controlled remotely from Canberra . Miss 8 took notes so she could share the information with her class when we returned (nothing beats an educational holiday!!). We then made the short and scenic walk to the cemetery where previous lighthouse keepers and local families were buried. If you ask me, there was a really spooky vibe happening, especially after hearing some of the stories behind their deaths, it was no surprise to hear that this lighthouse station was dubbed ‘The Lighthouse of Tragedy”. 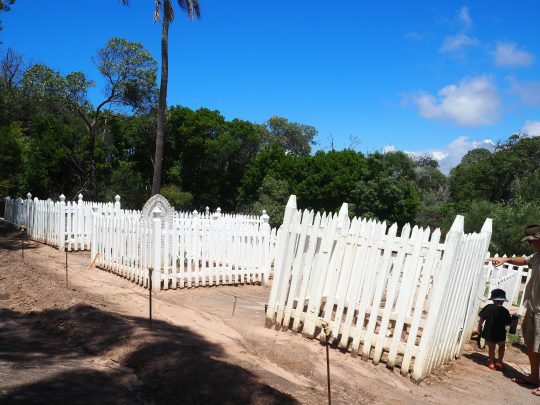 Bustard Head Lighthouse Cemetery or otherwise known… ‘The Lighthouse of Tragedy’. After a short walk back to the LARC it was time to return to camp for a satisfying picnic lunch (with freshly made Billy Tea on the fire). Heading down the steep track was even more exhilarating than the climb – with epic views back along the coast to 1770 – simply breathtaking!! Descending back down Bustard Head on the LARC! Base camp – getting ready for some yummy lunch and Billy Tea! 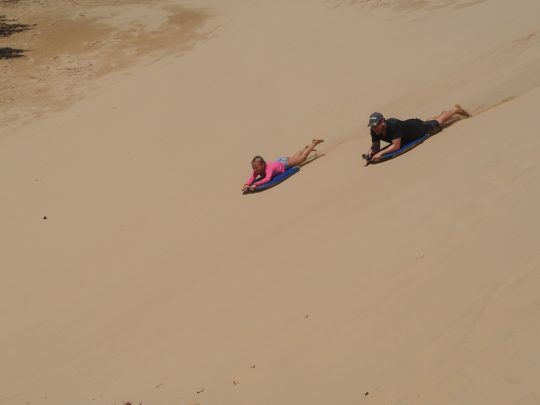 After lunch it was time for something our kids were really looking forward to…sand-boarding down a massive 35 meter sand dune! Blake parked us directly at the base and everyone quickly grabbed a board and climbed to the top. Quick family photo with the LARC! Ethan waxed the boards and gave everyone a gentle ‘push’ to started. 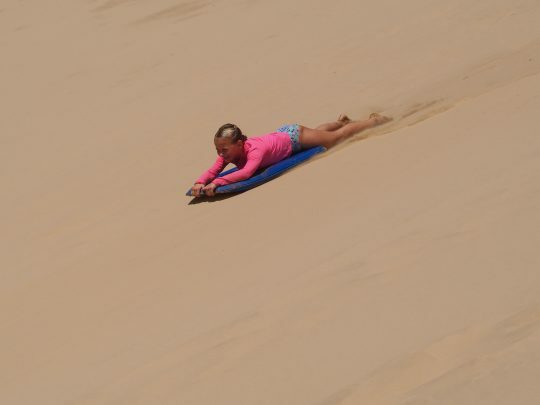 We’ve done sand boarding many times in the past but NEVER in a place where the dune meets the sea and turns the slide into a waterpark!! Mother Nature is better than any theme park!! 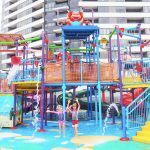 Miss 8 is a real thrill seeker so this was a major highlight of our Day Trip. Miss 8 racing Dad down the dunes on Middle Island! 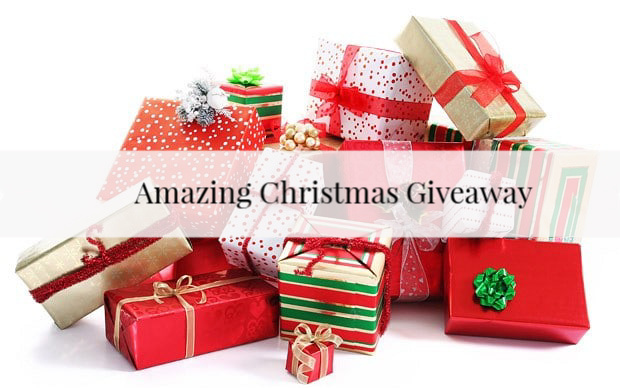 Check out the video below to see us in action! We then commenced our return trip along the beautiful coastline. We stopped a few times to view some more of the amazing wildlife that calls this coastline home, we spotted Black cockatoos, Oyster Birds & Kites just to name a few. Everyone was super relaxed on the return trip and I asked a few passengers what they thought of their day – they all had a resounding response – they LOVED it! 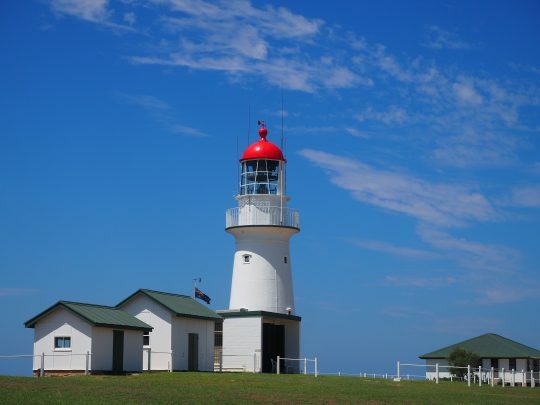 Unlike many tourism opportunities up and down the Queensland coast this one is very special and well worth a visit to Agnes Water and The Town Of 1770…including the only way to tour an active lighthouse, the only way to experience driving a LARK (yes, I said DRIVING!) both our children had a go behind the wheel! 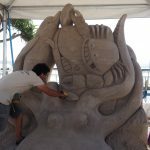 You can find a whole list of great LARC facts here. 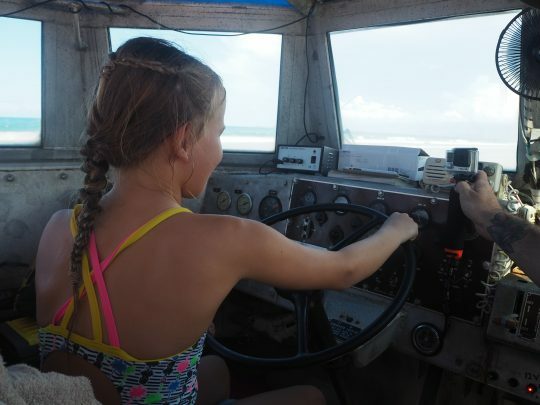 Miss 8 Driving the LARC! Do yourself a favour and book a visit to this magical part of Queensland, I promise you won’t regret it! Massive thanks to 1770 LARC tours for their fantastic hospitality and also to the Agnes Water Beach Club for providing our luxury accommodations. 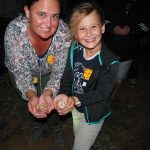 We’ll be back with another blog post detailing their fantastic accommodations soon but in the meantime be sure to head across to their website here and also be sure to check out the Visit Agnes Water & the Town of 1770 tourism website here. You can follow 1770 LARC Tours on Facebook and Instagram too! View the full length version of our Paradise Tour below.